Do You Feel the Signs of Aging? When you look in the mirror, maybe you notice wrinkles, sagging skin, dry skin or a loss of firmness that you once had. This loss of elasticity can appear in our face, our joints and in our abdomen area as well. As we age, our body begins to lose some of its firmness. ThermiSmooth is a new tightening technology driven by the science of heat. It uses a regulated radiofrequency to deliver a tighter and better defined shape for both facial and body rejuvenation. The tissue treated with Thermi undergoes a radical change in terms of collagen remodeling and regeneration. During the treatment, a small circular tool is placed on the area to be treated. The tool slowly begins to heat up as it moves over the area. Your provider can adjust the heat based on your sensitivities. Generally, the treatment feels like a hot stone massage and is very comfortable. Brows: If your eyebrows have started to sag, or your lids feel a bit hooded, Thermi can help you postpone surgical options or avoid them altogether. Under-eye area: Thermi reduces the bulge and smooths the skin to give you a more rested appearance. Jowls: Thermi tightens the sagging skin in the lower face and can also help with submental fat (“double chin”) by tightening or debulking. 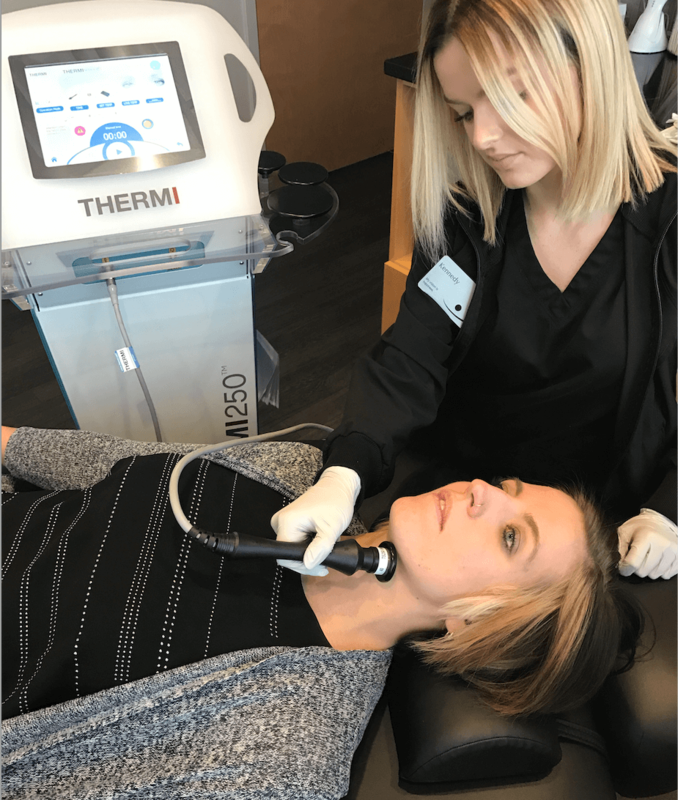 Thermi helps restore a more youthful profile. Neck: Thermi can tighten and restore a wrinkly, sagging neckline. Adipose tissue is targeted; the skin is tightened; and there is no pain! The best results will be seen in patients who are at their ideal body weight but have trouble areas that don’t respond to exercise.